Logos, images, silhouettes . . . we can do it all in beautiful color and detail. Our process ensures your graphics will look great year-after-year. 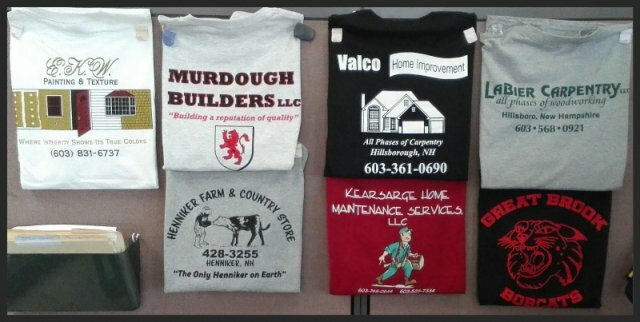 Get your shirts, jackets, and more done quickly and professionally by a local provider who values your business. Not many area printers can say they offer in-house heat pressing. With a full stock of letters and numbers (in various colors and sizes) and an image printer, we can do almost any job in a timely and professional manner. Our products are rugged to ensure a long lifespan. Everybody LOVES getting swag! Whether it’s freebies for special events or gifts for business partners, we offer hundreds of items that can be customized with slogans and logos. Instantly turn anyone into a brand ambassador with high quality promotional products from a local provider. Getting customized, screen-printed shirts, sweaters and other promotional items is something that can really help your business grow! We can work with you on any sized order and provide you with a free quote so you can make sure you aren’t being over-charged by the competition.